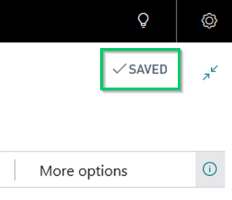 Current Business Central customers as well as customers of Dynamics NAV are very familiar with the concept of autosave common in our products. This is a very much loved and welcomed feature, but we heard from many of our customers moving from other ERP systems that they are not aware data is saved and secured in Business Central—even without explicitly using any save function. It is for those customers that we have built a smart autosave indicator showing when the data is being saved for them. This new element indicates directly the state of card or document data being saved in the background and provides any user with a clear indication that the entered information is secure.